In a twist on the Steve Martin and John Candy movie “Planes, Trains, and Automobiles,” my May adventure took me on Planes, Horses, and Automobiles. Well, not exactly. Let me explain. I started by flying from Chicago to Louisville, accompanied by Scott Marzec, Member Programs Manager for NationaLease. We landed and drove across the bridge into Jeffersonville, Indiana, where we met with Wade Bryant and Ken Baker of Century Leasing LLC, a NationaLease Member. We discussed the recent Maintenance Managers Meeting and the upcoming Annual Meeting in Washington D.C. on September 20-21, as well as the upcoming Sales Meeting in November in Ft. Lauderdale. We also got a tour of the new state-of-the-art addition to their shop, which adds the capability to repair CNG units. The four of us got in Ken’s truck to go to lunch, but first, we made a detour into Churchill Downs. Ken had acquired a pass that let us into the stable area and they had heard that American Pharaoh had been at the track earlier in the day, so we drove around looking for his stable. 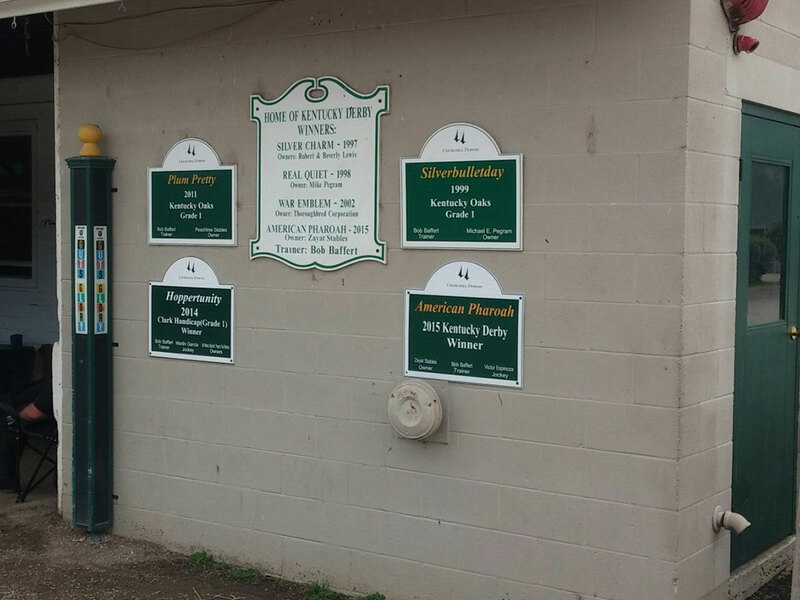 We found the stable, but an armed guard informed us that American Pharaoh, was “not available” at that time, so I don’t have a photo to share. Of course, we had to at least take a picture of the stable! We continued toward downtown Louisville, with Ken and Wade giving us the guided tour, and ended up at 4th Street. This pedestrian-only street is a couple of blocks of all kinds of entertainment, from bowling alleys to restaurants with a stage set up in the middle to host live concerts. After a great lunch, Scott and I continued our journey east to Lexington, just in time to encounter a downpour that followed us intermittently the whole way. We arrived in Lexington mid-afternoon, so after a few hours of catching up on emails and phone calls, Scott and I met up again for dinner. Palmer’s was next door to the hotel and had outdoor seating, so we decided to give it a try despite the black clouds overhead. We found a table on the patio overlooking a pond and were soon joined by a brood of baby ducks and their mother. They weren’t fazed by the rain that started to fall, and neither were we, thanks to the awning overhead. Later that night, just around dusk, a beautiful double rainbow filled the sky and even made the next morning’s local news. The next morning, we drove over to Worldwide Equipment Leasing, Inc., a NationaLease member to meet with Dan Dennis, David Foster, and Mark Hamilton. We spent the morning going through a presentation on all of the NationaLease programs, including Reciprocal Service, our Supply Management programs, National Accounts, and our education programs. We talked about NationaLease insurance programs, including our point-of-sale rental insurance, the new NationaLease Emergency Services and Fuel Directory App, NationaLease Road Rescue, our 24/7/365 emergency breakdown service, and the new NationaLease Fleet 20/20, a web portal that will allow our customers to view and manage their fleet through an online platform. We also discussed the upcoming Introduction to Full Service Leasing seminar that will be held in Lisle, IL on June 17-18. Most importantly, we learned a lot about Worldwide’s business and the tremendous service they provide to their customers. As we left Worldwide, we had a few extra hours before we had to be back in Louisville for our flight home, so we decided to take the scenic route. There are basically two things on the road between Louisville and Lexington: horse farms, and bourbon distilleries. The horse farms are spectacularly outfitted with stables that we frequently mistook for mansions, miles of wooden fences over rolling hills, and impressive stone and wrought iron entrance gates proudly displaying the name of the farm. It is a beautiful drive, especially at this time of year when everything is green and blooming. We passed a sign for a town called Midway, and I remembered that Wade and Ken had mentioned it the day before. We turned down the road and found ourselves in an historic downtown filled with local shops, cozy tea rooms, restaurants, and beautiful local architecture. Historic Midway was the first town in Kentucky founded by a railroad, but the town’s history began long before that when the area was inhabited by Indian Mound Builders. Two large Indian mounds have been identified on farms near Midway, as well as several smaller such structures in the outlying areas where they still exist today. We had a bite to eat there before we got back on the road to Louisville. Unfortunately, we didn’t have time to take in one of the many distillery tours offered on the Bourbon Trail. We will have to save that for our next trip to Kentucky! We arrived in Chicago late that night, but my road trip wasn’t over yet. The next morning, Kelly Kordowski, Member Services Advocate for NationaLease, joined me for the next leg of my journey, as we drove west from Chicago headed for Des Moines. I wish I could share some exciting details of the five hour drive, but honestly, there is not a lot to see on that route. Once you leave the Chicago suburbs, the landscape of corn and soybean fields doesn’t vary much for the next few hours. Along Interstate 80, you do pass Iowa 80, the world’s largest truck stop! We did find one hidden treasure on the way. We were ready to stop for lunch as we approached Grinnell, Iowa. Kelly pulled out her phone and found reviews and directions to The Prairie Canary in downtown Grinnell. It was definitely worth the short detour! Situated in an historic building, the Prairie Canary takes pride in serving locally grown food and using local artisans for everything from hand-thrown plates and bowls, to the handcrafted hickory tables. Not to mention, the food was delicious! The next morning, Kelly headed to the airport for an early flight, and I kept going west to Omaha, where I met with Ryan Peterson and Steve Bishop of Truck Center Companies, a NationaLease Member. Ryan, Steve and I spent some time reviewing the many purchasing programs Nationalease has available to our members. We provide them with the ability to purchase from the top vendors in the industry so that they can maintain their vehicles with the best available products and keep their customers on the road with the least amount of downtime possible. I also showed them a few additional resources on our website, which is filled with information for members and customers alike. Planes? Check. Automobiles? Check. Horses? Well, kind of. I didn’t actually use any horses for transportation on this trip, but it made me think about the various modes of transportation that we all rely on. 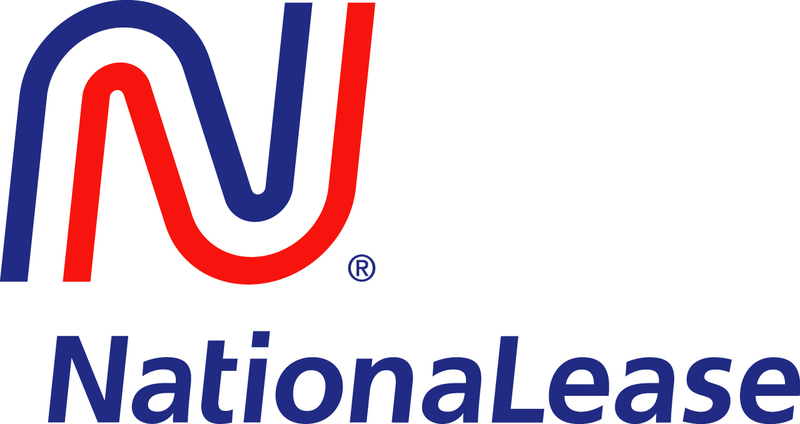 Looking back at the history of NationaLease, some of our member companies got their start leasing horses and buggies. Today, our members lease some of the most technologically advanced pieces of equipment on the road. Regardless of the mode of transportation, NationaLease and our members’ commitment to providing the highest level of service to our customers has remained constant for nearly a century. I, for one, am glad we no longer rely on horses to get around. My road trips would certainly take a lot longer, even if American Pharaoh was available.